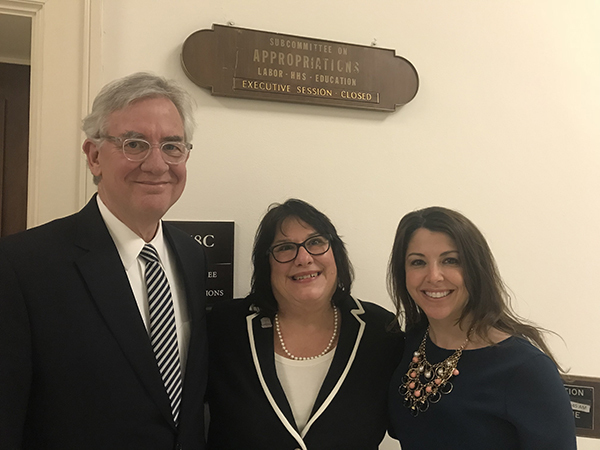 Washington, D.C. -- Today, Joyce Knestrick, PhD, APRN, CFNP, FAANP, President of the American Association of Nurse Practitioners (AANP) testified before the House of Representatives Appropriations Subcommittee on Labor, Health and Human Services and Education. During her remarks at this mornings hearing, Knestrick advocated for continued investments in nursing education and workforce programs. She highlighted how such investments have a direct and positive impact on the health of our nation and addressing one of our most urgent public health challenges: the opioid epidemic. Dr. Knestrick also reinforced the need to remove outdated barriers to practice for NPs. Doing so, she made clear, ensures patients have better access to the right care at the right time. As Congress considers investments that strengthen Americas access to high quality care and grapples with solutions to address the skyrocketing incidence of opioid use disorder, we must look to the outstanding skills and expertise of Americas nurse practitioners (NPs) said Knestrick after her testimony. Ensuring access to care for all patients goes hand in hand with expanding access to NP education programs. Congress understood this when they implemented these strategic programmatic investments, and today were seeing the benefits. More than 248,000 licensed NPs are delivering primary, acute and specialty care in more than 1 billion patient visits annually. This is a significant net positive for our country, and its our goal to build on this collective success so that we can meet patients most pressing health care needs, from tackling chronic disease to the opioid crisis.